The mission of the Office of the District Attorney, 7th Judicial District, is to promote justice by providing the highest quality legal services for the people of the State of Colorado and to promote public safety by supporting strong communities. The District Attorney Serves the 7th Judicial District. The Seventh Judicial District is comprised of six (6) counties: Delta, Gunnison, Hinsdale, Montrose, Ouray and San Miguel. The geographical area of these six Colorado Western Slope Counties is in excess of 9500 square miles. The many communities in the Seventh Judicial District vary in character from rural to frontier, resort to remote, agricultural to mining, retirement to university. The District Attorney’s Office serves these counties and their many communities in four (4) separate offices, located in the towns of Delta, Gunnison, Montrose and Telluride. Each county has a Courthouse located in the county seat, and Montrose County also has an Associate County Court that hears cases in the town of Nucla in the West End of the County. The District Attorney appears in all six counties and the Associate Court in Nucla. The District Attorney’s Job is to Prosecute State Law Violations. The District Attorney prosecutes persons who have violated State law as defined by the Colorado Legislature. The District Attorney has no authority to enforce federal law or municipal law. The District Attorney appears on behalf of The People of the State Colorado in criminal cases brought against individual Defendants when there is probable cause to believe they have committed a criminal act. The District Attorney prosecutes over 5000 cases per year, ranging from traffic violations and DUI’s, to misdemeanors and domestic violence cases, through felony drug and serious violent crime cases. 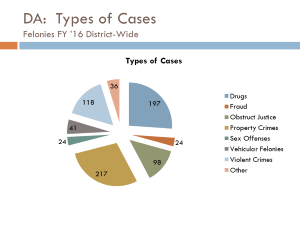 For detailed and county by county data regarding cases prosecuted by the District Attorney, go to https://www.courts.state.co.us/Administration and view the latest Annual Statistical Report. The District Attorney is An Independent Office. The District Attorney is an independent Office created by the Colorado Constitution. The District Attorney and the employees of the District Attorney are not State employees and are not County employees. The District Attorney is An Elected Position. The District Attorney is elected every four years and is term-limited to two terms, for a total of eight (8) years. Voters in all six counties of the Seventh Judicial District may vote for the District Attorney. The District Attorney is Funded By the Counties. The Office of the District Attorney is funded by the six counties of the Seventh Judicial District, and is not funded by the State of Colorado. The District Attorney receives over 80% of its funding from the counties. Additional funding comes from grants and from administrative funds associated with the District Attorney’s statutory obligation to administer the Crime Victim’s Compensation (CVC) fund and the Victims and Law Enforcement (VALE) fund. 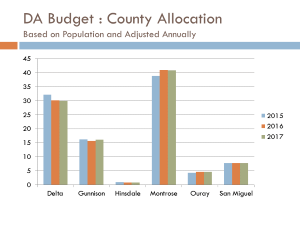 Funding is allocated between the counties based on population and adjusted every year. The District Attorney’s Annual Budget is Over Two Million Dollars. The total annual budget for the District Attorney’s Office is just over $2.3 million dollars. Eighty-five percent (85%) of the funding pays for personnel expenses. Operating expenses are primarily expended for administrative costs, transportation expenses and information technology (IT) needs. The District Attorney Has Twelve Attorneys and Twenty Staff Positions. The District Attorney’s Office is funded for twelve (12) attorney positions in addition to the elected District Attorney. The Office has one Assistant District Attorney and eleven (11) Deputy District Attorneys. 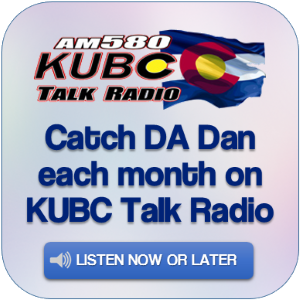 The District Attorney employs two investigators who are Certified Peace Officers in the State of Colorado. The staff of the District Attorney is comprised of Legal Services Staff and Victim Services Staff. The Office has one part-time Administrative Services Staff member. District Attorney Dan Hotsenpiller has been practicing law in Colorado since 1988. After graduating from the University of Colorado School of Law, he started his legal career in Denver assisting insurance companies investigate fraud and arson cases. He moved to Montrose in January of 1994, joining Charles R. Greenacre, P.C., in general practice. DA Hotsenpiller began his professional public service in September of 1994 as a Deputy District Attorney. Over the next ten years, he prosecuted cases throughout the Seventh Judicial District, being assigned to the San Miguel County Office, the Delta County Office and the Montrose County Office. From 2005 to 2010, DA Hotsenpiller worked in private practice with his law partner, Jim Delman, emphasizing criminal defense and family law. On January 25, 2011, Mr. Hotsenpiller was appointed by the Governor to fill a vacancy in the District Attorney position. DA Hotsenpiller was elected to serve in November 2012, and sworn into Office on January 8, 2013. Since being appointed, DA Hotsenpiller has worked to build effective relationships with area Law Enforcement agencies, to increase the capacity of the District Attorney’s Office to effectively prosecute offenders, to promote a victim-centered prosecution focus, and to bring up-to-date tools and technology to the Office.